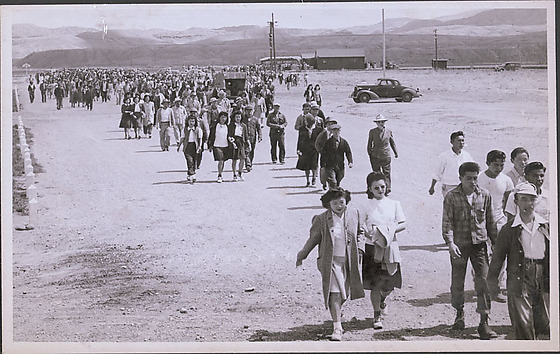 Large crowd of people walking towards the camera. There is a car on the right and buildings in the distance. Heart Mountain evacuees heading back to camp after sending off friends who were leaving Heart Mountain for their new or old homes. This is dated May 1945 and took place after dinner. Most of the people headed to the area from where they came from originally. Most of them headed to the area from where they came from.